You are here: Home / Green Living / Stop Drinking Bottled Water to Save Money and Go Green! Over the years, we have spent many hours as a family at the tennis court, soccer field, and school events. The one thing all of these places have in common is a ridiculously large output of disposable plastic water bottles. Single use plastic is destroying our environment and if we could all just stop drinking bottled water, our planet’s plastic problem would be significantly smaller. Is plastic really a problem for our planet? And how do you quit a habit like this? 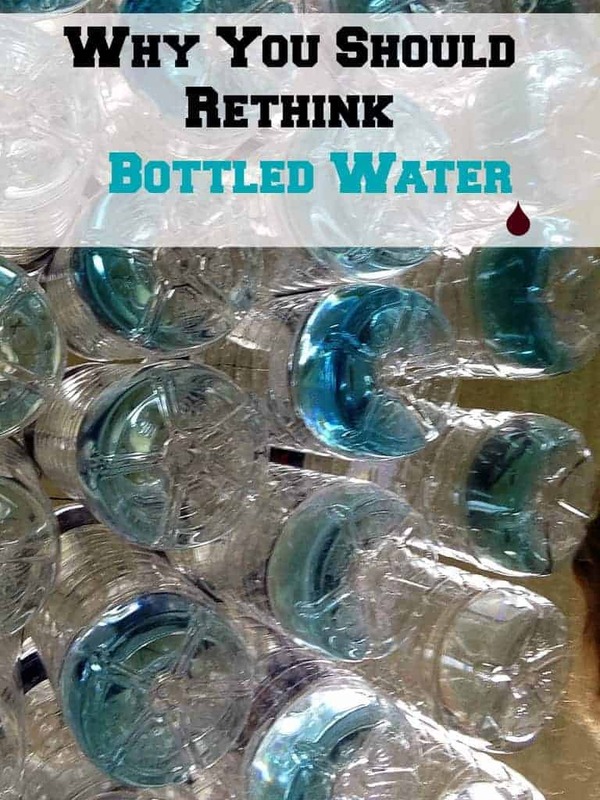 I thought I would give you some insight into plastic pollution and share some tips to help you break your bottled water habit for good. Bottled Water: Why are you buying it? Every time I go to the grocery store, I see tons of people buying bottled water. Alkaline water, spring water, and an assortment of other bottle water varieties are all available in just about every store you go into. According the most recent facts I find online, the bottled water industry is a booming, $16 billion business. How many of those dollars are YOURS, just because you can’t stop your bottled water habit? According to StatisticBrain.com, the average person buys 167 bottles of drinking water every year which has created a totally unnecessary multi billion dollar industry. The bottled water industry contributes tons of waste to our environment, not to mention the pollution created during production of those convenient plastic bottles. Unless you are living in a third world country (or, sadly enough, a few cities here in the US), your tap water is most likely not so bad that you can’t drink it right from the faucet. In fact, 30 percent of bottled water IS actually tap water! I’m not naming brands here but chances are your bottled water isn’t actually from some pure mountain stream like you think it is. Taste tests have actually shown that in side by side comparisons, most people prefer the taste of actual tap water! Crazy, huh? Check out the video below to learn more about the totally manufactured demand for bottled water. There are a lot of little things you can do to reduce your carbon footprint and ditching the bottled water is one of them. So, how do you do this? It is really pretty simple. 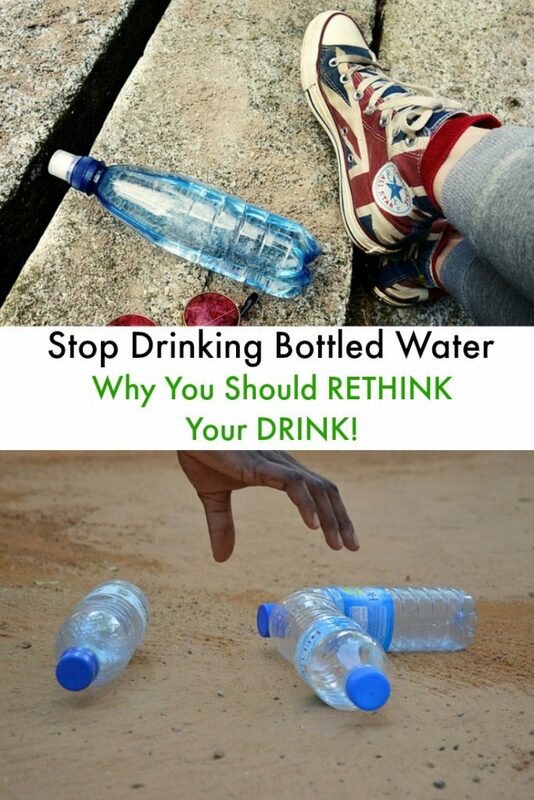 Stop wasting your money on disposable plastic filled with not quite so tasty water! You have a faucet in your house. Use it! Buy a reusable water bottle and a water filtration system for your sink. You will be saving the planet while you save a few dollars. Head over to CreativeGreenLiving.com and learn how to make an etched glass water bottle to carry your tap water in style. Check out Food and Water Watch. Share the site with your own followers, friends, and family to raise awareness. Learn more about what’s in your drinking water and how to choose a water filter system. Don’t leave home without a reusable water bottle for you and your kids. Teach your children early that water comes from a TAP, not from a disposable plastic water bottle that you buy at the local mini mart. Green and healthy habits start when kids are young so teach them to carry a reusable water bottle with them when they go out. Want to stop buying bottled water? Find a replacement that still allows you to stay hydrated on the go. Choose your favorite material. This is really a personal preference. 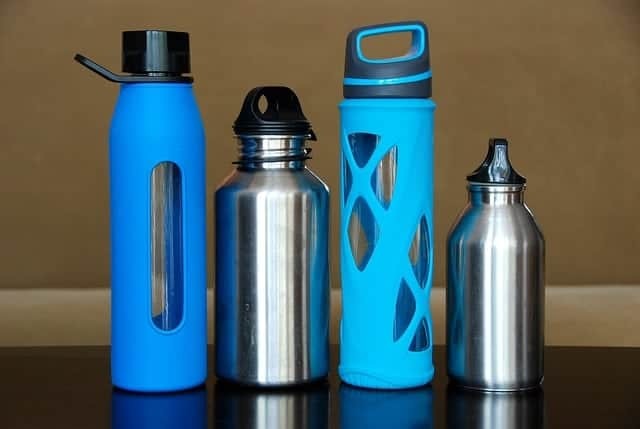 There are water bottles made of glass with a plastic protective sleeve on the outside, stainless steel, or BPA-free plastic. Try out a few and see what you like. Do you need insulation? Some water bottles are insulated to keep your cold beverages cold. If you will be gone all day or your water bottle will be sitting in a hot car frequently, consider one that has insulation. The drawback to insulated water bottles is that they usually have a smaller volume since the insulated wall is fairly thick. Do you need it to be dishwasher safe? Not all water bottles are as easy to clean as others. If you plan on throwing it in the dishwasher frequently, make sure it is dishwasher safe. Will it fit in your cup holder in your car? This is a huge pet peeve of mine. When I drive, I like a water bottle with me. Finding one that fits in the cup holder can be challenging. Ease of use is important. Juggling grocery bags, kids, strollers and an assortment of other things? You may appreciate being able to drink your water one handed! You may also like one that has an easy way to attach it to your backpack. Bottled water is really just a habit. A very expensive one that is destroying our planet. If you want to give up bottled water, you need to have a plan. Arm yourself with knowledge and a few key supplies. And stop being afraid of your tap water. Buy a filtration system and a reusable water bottle. The planet will thank you! Have any other tips to stop drinking bottled water? Although I don't agree with your stance on bottled water I do see your point. And I respect your opinion. I appreciate your comment and am curious about how you feel about the bottled water issue! Thanks for the invite....always happy to find new ways to spread the message! Do you have to provide bottled water? Why not bring a large Igloo cooler with water and reusable cups (dollar store has great ones!). We don't buy bottled water anymore and instead use reusable bottles for all of our activities. Great post! I use to be a HUGE water bottle drinker! I actually believed that it was better for me! When I 'grew' up I realized that it wasn't good for the environment and have since switched to reusable bottles and my tap! More people need to be aware! The team should invest in reusable water bottles that they can refill with a jug. We've cut our bottle buying in half so far buying a water dispenser that we refill at our local grocery store for pennies! My ta water tastes gross and we have drunk filtered watered for a while now.